UW institute's assessment shows increases in opioids, cirrhosis, diabetes in Washington state, and dangerous signs nationally. Health disparities’ among U.S. states are highlighted in the most comprehensive state-by-state health assessment ever. 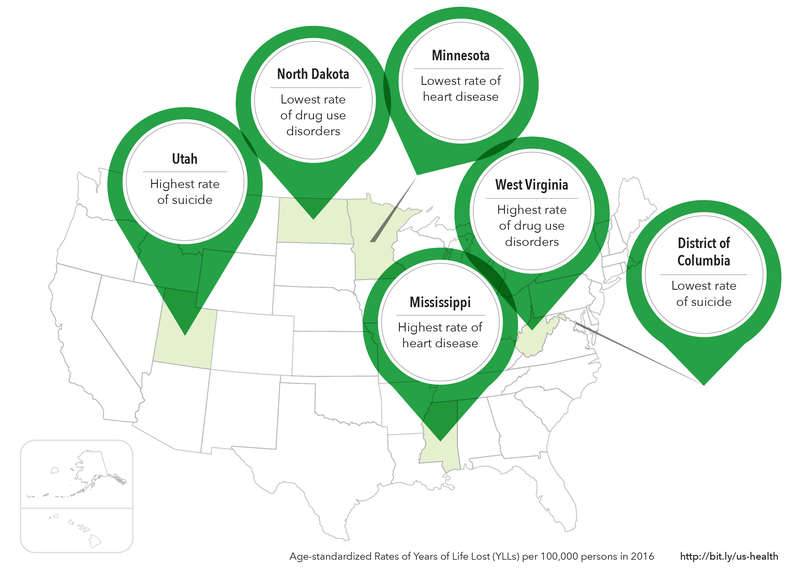 The years of life lost in Washington due to opioid-use disorders increased more than 400 percent over the past 26 years, according to the most extensive state-by-state U.S. health study ever conducted. However, years of life lost to motor vehicle road injuries dropped more than 30 percent over the same period. Nationally, Washington is seventh in the nation for lowest rates of years of life lost, with lower rates found only in Minnesota, California, Connecticut, Hawaii, New York, and Massachusetts. Low back pain topped the list of problems causing Washington residents to live with years of disability in 2016, followed by major depression and other musculoskeletal disorders. While diabetes ranked fifth on this list, at 154 percent, it represents the largest increase in nonfatal health loss in the state over the 26-year period. A vendor’s offering at the Washington State Fair in Puyallup. High body-mass index was the top risk factor for death in Washington in 2016. Flickr photo by PT Murphus. In addition, years of life lost from cirrhosis due to alcohol use and cirrhosis due to hepatitis C both increased more than 140 percent between 1990 and 2016. High body-mass index remained the number one risk factor causing both death and disability in Washington in 2016. Others in the top five are (in order) smoking, high fasting plasma glucose, high systolic blood pressure, and drug use. Nationally, working-age Americans in 21 states faced a higher probability of premature death from 1990 to 2016. The likelihood of early death for men and women age 20 to 55 is highest in West Virginia, Mississippi, and Alabama. In contrast, same-age residents of Minnesota, California, New York, and several northeastern states have a lower probability of premature mortality. Opioid use disorders rose from the 11th-leading cause of disability-adjusted life years (DALYs) in 1990 to the seventh leading cause in 2016. In addition, the burden of mental health disorders is increasing in the United States with DALYs; major depression increased over 27 percent nationwide between 1990 and 2016. Similarly, the burden due to anxiety disorders increased by about 31 percent and totaled 1.76 million DALYs in 2016. There also were increases between 1990 and 2016 nationally in Alzheimer’s disease, which moved from the seventh leading cause of YLLs to the fourth; diabetes rose from 12th to eighth. NOTE: An in-depth study of cardiovascular disease from this study titled “The Burden of Cardiovascular Diseases Among US States, 1990-2016” will be published April 11 in JAMA Cardiology.